Boiler not working – are your pipes frozen? With imminent cold weather just around the corner, we consider the impact this can have on your boiler. Waking up to no heating is not fun when the weather turns cold! One of the most common problems in the winter is frozen or blocked condenser pipes. In this post we show you how you can take a few easy steps to see if you can fix the problem yourself and how to prevent it from happening in the future. 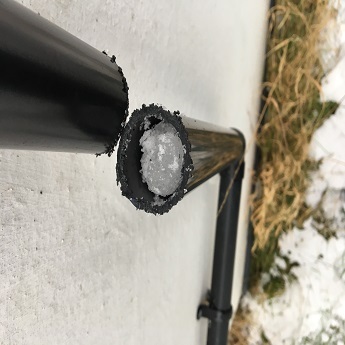 Why does the condensate freeze? Condensing boilers are energy efficient as they reuse the heat from the flue gases, however during this process the boiler produces water vapour. This then cools to leave condensate in the pipe. Where the condensate pipe is located outside, when the cold temperatures hit, it is vulnerable to freezing. This then causes a blockage, which in turn shuts down your boiler. First, simply turn your boiler off. You will then need to go outside to locate the pipe that comes out of the boiler. If you have easy access to your boiler pipe, then there are a few things you can try to solve the problem. To clear the frozen blockage, you can pour warm water over the pipe. It is very important not to use boiling water. You may need to repeat this process a few times to defrost the pipe. Once this has been done, you should turn the boiler on to test if it has worked. If you still have problems, can’t find the pipe, or it is too dangerous to reach then please get in touch with us to arrange for a qualified heating engineer to come out. Cover the external condensate pipe with a foam insulation. The other option is to leave your heating on low overnight to keep the condensate pipe warm. Not only will this stop it from freezing; your boiler will take less time to heat your home in the morning. At Carshalton Boilers, we specialise in boilers and heating. We’re a friendly, family run business who cover South London, Surrey and surrounding areas.